Panama is know the world over for it’s Canal. Everyone should experience the Canal at least once in their life. I’ve been through the Canal about 50 times or so by now, and it never ceases to amaze me. We live in a throw away society. How long does your iPhone last? Three months … and it’s time to upgrade! You’re lucky if you can get two years from your computer. Yet here is something that was designed and built over 100 years ago, and it is still working as planned! 365 days a year, 24 hours a day! 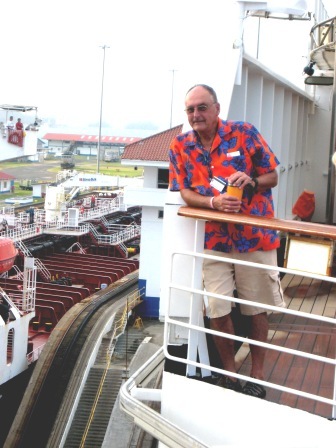 The best handbook for preparing for your Panama Cruise and the cruise itself is my book PANAMA CANAL DAY: AN ILLUSTRATED GUIDE TO CRUISING THE PANAMA CANAL. I said, “Cap, just get through the first 150 pages and you will be hooked,” and he was. Aside from the fact that McCullough’s book is 698 pages of heavily-footnoted history, it covers ONLY the period, as the title indicates, of 1870-1914. While it is a great read, it does not cover much of the stuff that cruise passengers need to know about Panama and its history before 1870 and after 1914. So that’s why I wrote my book, PANAMA CANAL DAY: AN ILLUSTRATED GUIDE TO CRUISING THE PANAMA CANAL, for cruise passengers, and besides it’s only 374 pages.